This week, we’re featuring venison! 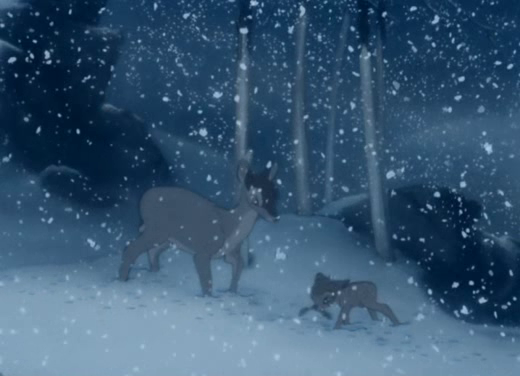 Say goodbye to Bambi’s mom! Ok,not really. 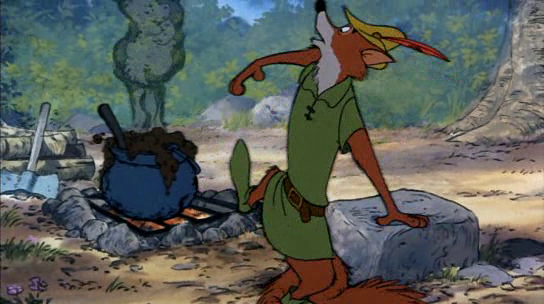 The food featured in Bambi isn’t the tastiest, probably because it’s not really meant for human consumption. 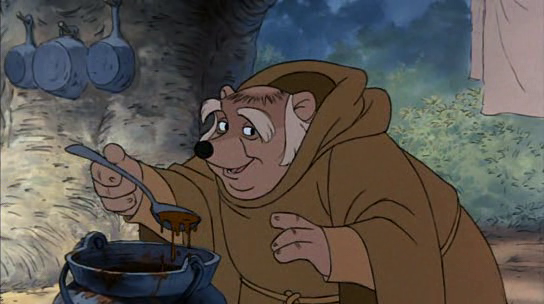 However, most of the animal food featured in Bambi is edible to humans. So consider this a survivalist article. So get ready to eat nasty food and feel bad about humans existing. 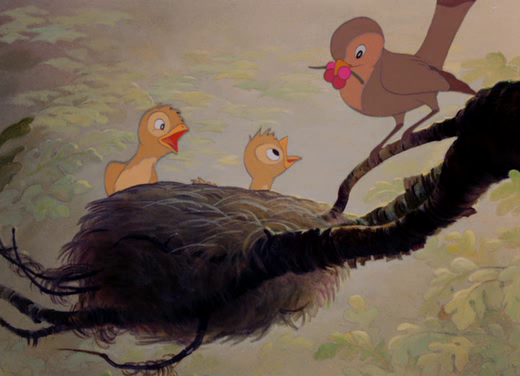 Within the first few minutes of the movie, we see a mommy bird bringing pink berries for her babies. While it was tempting just to go to Pinkberry and get some frozen yogurt, I decided to stay true to the movie and get some actual berries. I searched pink berries and found a certain berry called a Snowberry. That is probably the type of berry the mother is feeding her babies. However, I also found that snowberries cause stomach aches, so I opted for Red Currants instead, which can be pinkish as well. 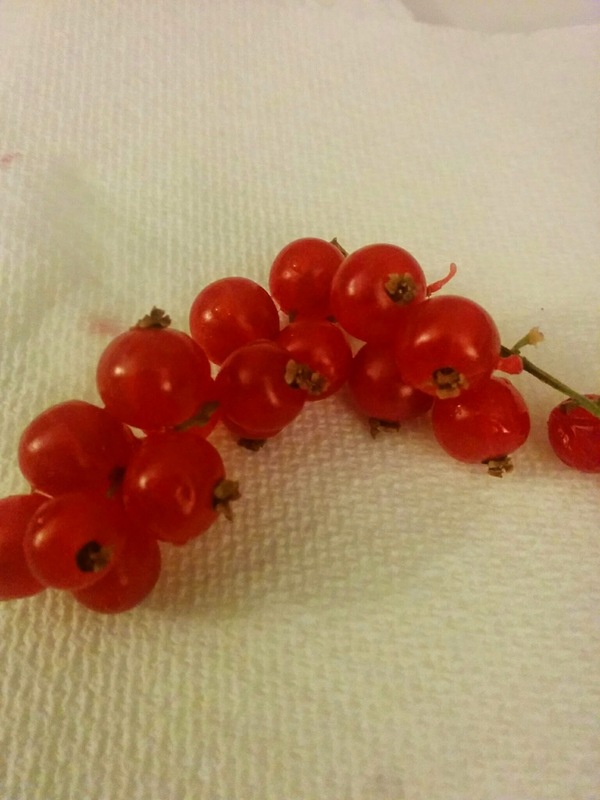 Red currants are actually in the gooseberry family (see my Snow White article). 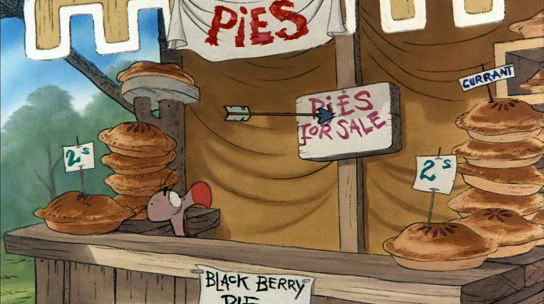 They are VERY tart but they mix well with other foods. I was able to find them at my local grocery store. Although, in the theme of making this a survivalist article, here’s a link to some common wild berries so you know what you can or cannot eat. We next see a squirrel and a little chipmunk sleeping under its bushy tail. 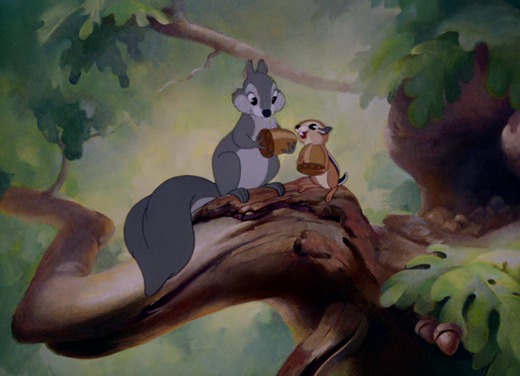 I love how the chipmunk and squirrel are friends. They nibble on some acorns. Acorns are actually edible. 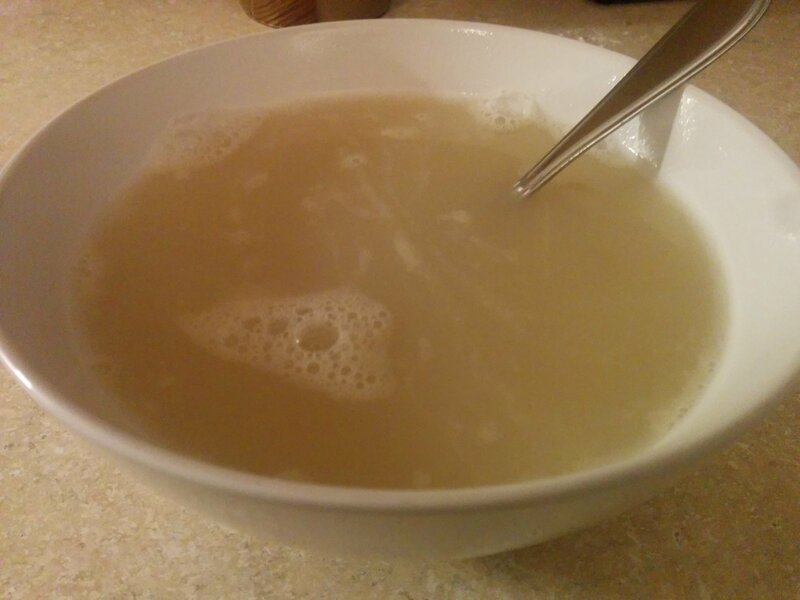 However, you need to soak them in warm water until they aren’t bitter anymore. The soaking takes out the toxins in the acorns so you don’t die. Sadly, I was not able to get my hands on any acorns. Online I only found fake acorns for arts and crafts and since it’s winter here and I didn’t stock-pile up the acorns beforehand, I had trouble finding them on the ground. Maybe I need to make a couple more squirrel friends. This one was easy. 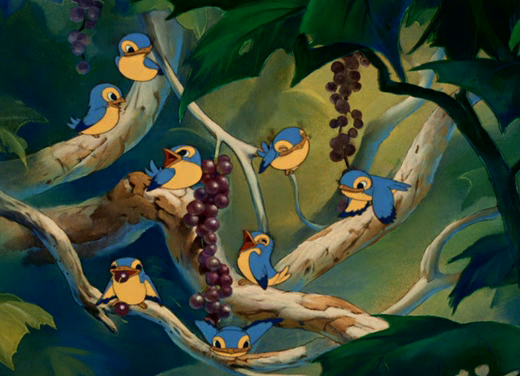 When Bambi and the bunnies are prancing around, Bambi stumbles across some birs eating, what looks like, grapes (they might be some other kind of berry, but they really look like grapes). Thumper comes along and tries to teach him the correct way to say bir-Ds. Well, you don’t need to be a bird to enjoy grapes. I’m just not sure if you’ll be able to find grapes in the wild. 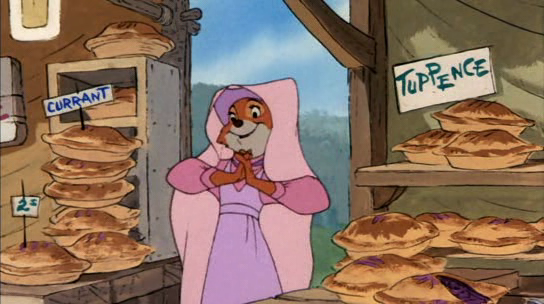 Who wouldn’t love a food that cute widdle Thumper loves? Bambi seems to like it too. Red clovers are actually really useful for humans too. They are used for cancer prevention, indigestion, high cholesterol, whooping cough, cough, asthma, bronchitis, menopause symptoms, sexually transmitted diseases (STDs), skin cancer, skin sores, burns, chronic skin diseases and even flavoring. (source: WebMD). Thats not even to mention that the greens make long ears and great big feet according to Thumper! However, I found that it isn’t the greens that are awful to eat, it is the blossom that he loves so much. 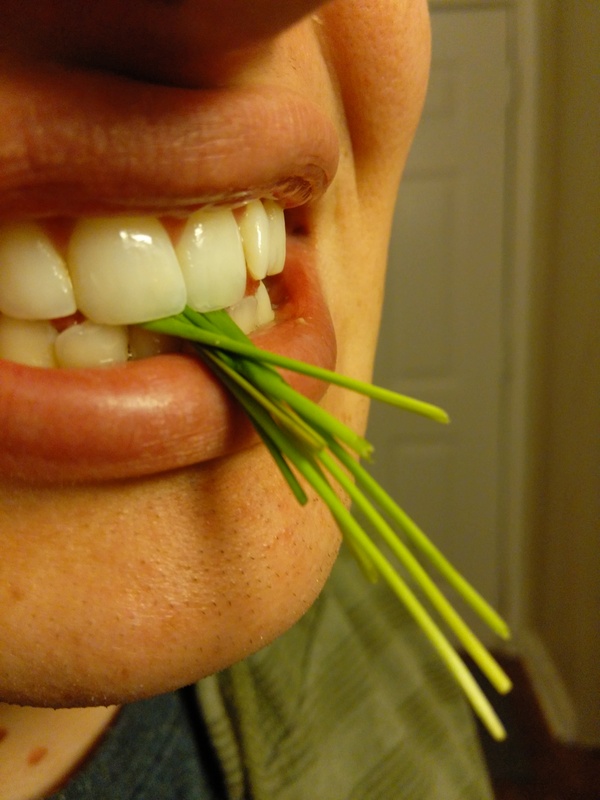 I tried some clover sprouts and they were actually pretty tasty, but then when I tried some clover blossom….bleh! So bitter and disgusting. 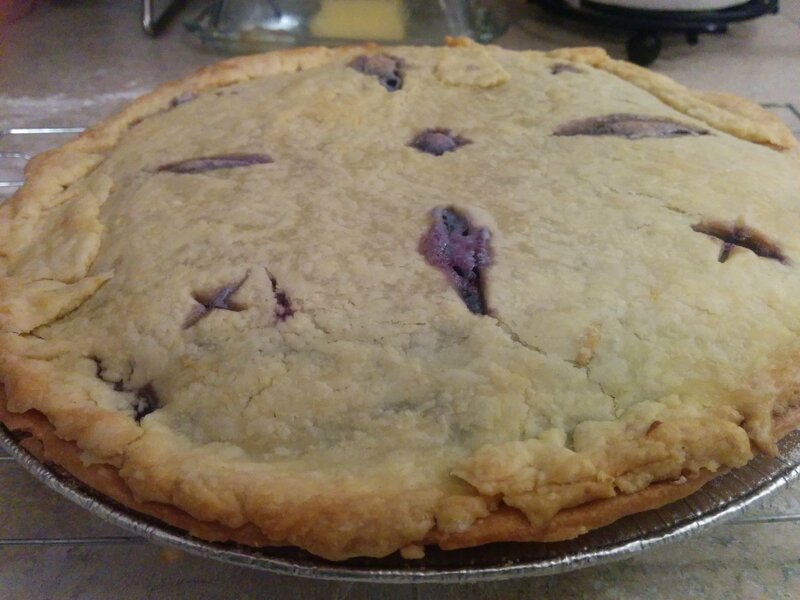 I even tried to steam it….but that made it worse. It smelled bad too. It’s supposed to be good for you though! When in the harsh winter, Bambi and his mom resort to stripping bark off of the tree. It’s the only thing they got. 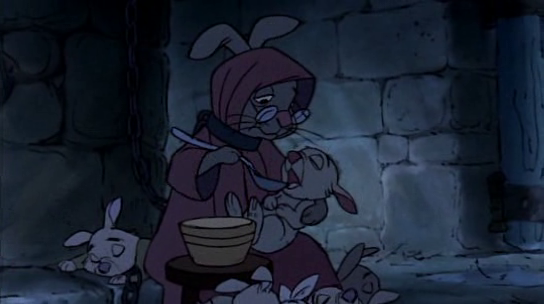 It would have been a pretty bad death if we had to see Bambi’s mom slowly die of starvation. 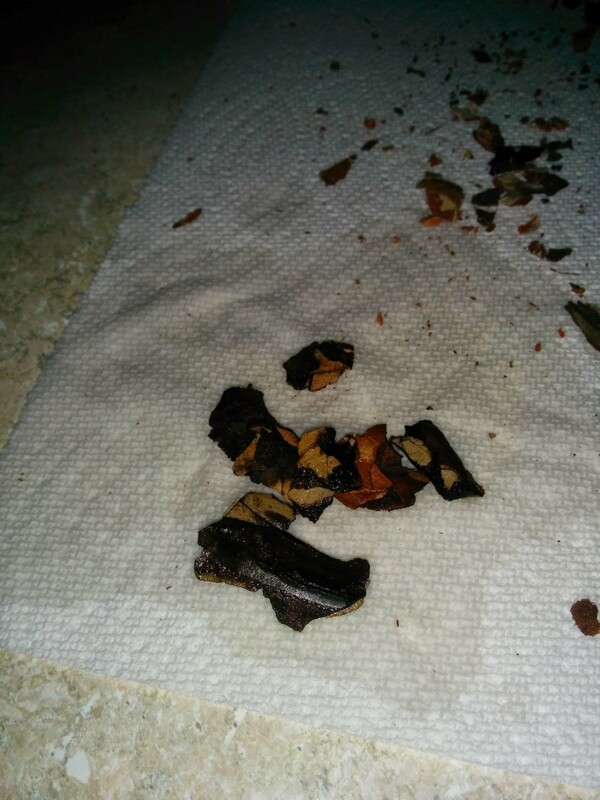 For humans, you can actually eat pine bark with very little preparation. Some of the main ways of eating it are boiling it and frying it. I tried it fried. You’re supposed to get the inner-most bark. That is apparently the most palatable. I don’t think the bark I got was deep enough. I had to act quickly when I was stripping off the bark because I was stealing it from a neighbor’s tree in the middle of the night. I didn’t want anyone to come out of the building and question why I was digging into their pine. The chips I got were kinda red and not the inner-tree white. 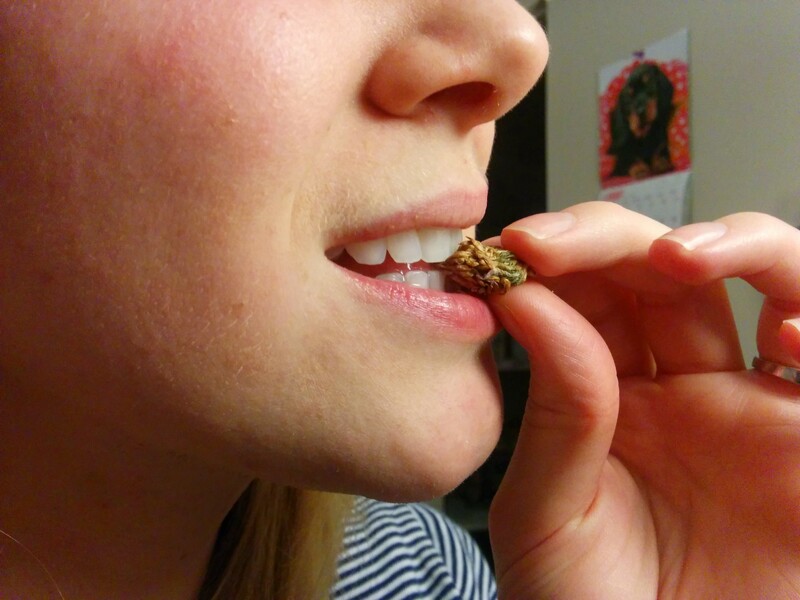 It tasted fine, It kinda crumbled in my mouth. I was thinking it was going to be crispier. It turned into a powder when I chewed. I wouldn’t go out of my way to eat it, but if I were starving in the wilderness, I wouldn’t mind snacking on pine bark. It would keep me from getting scurvy. Peel off the outermost bark of a pine tree. Peel strips of the white inner bark. Heat up a little oil in a frying pan. Add salt if you wish. After the harsh winter, and right before the sad part of Bambi’s mother dying, Bambi finds a patch of grass and starts chowing down. Well I tried eating grass. 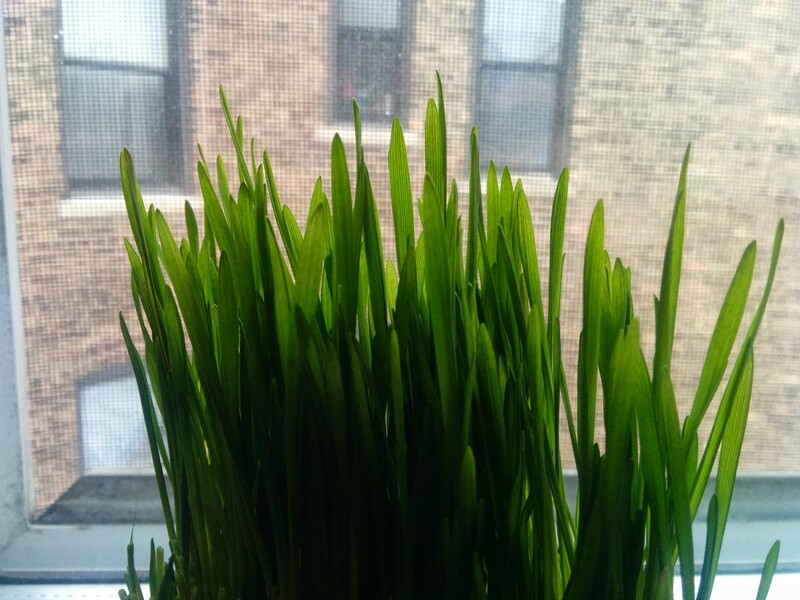 It’s wheatgrass. You might recognize it from your local Jamba Juice. It tastes like…well, grass. Nothing special. I’m not going to use at as a midnight snack though. I only wish I could be as excited as Bambi to eat it. 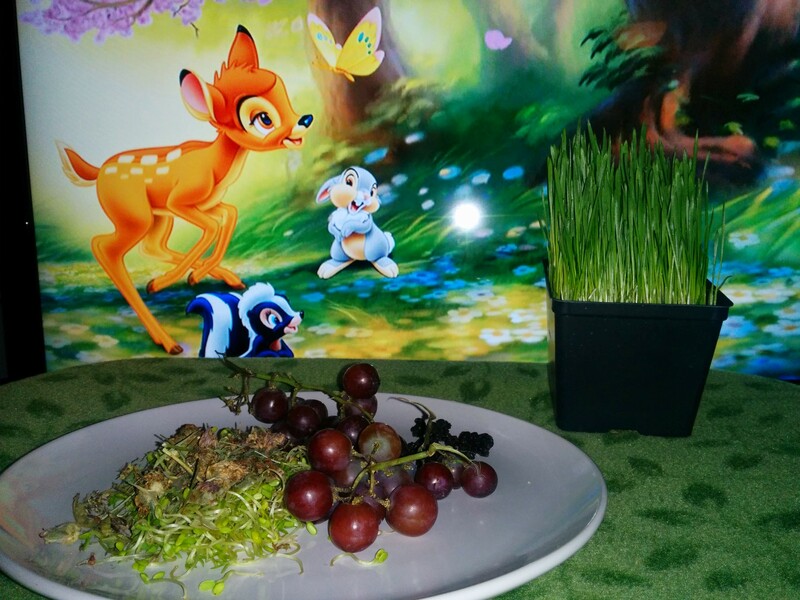 So we wanted to make something using lots of the food shown in Bambi as ingredients, so we made a salad! I actually found that the gross red clover can make a fairly tasty salad dressing too. 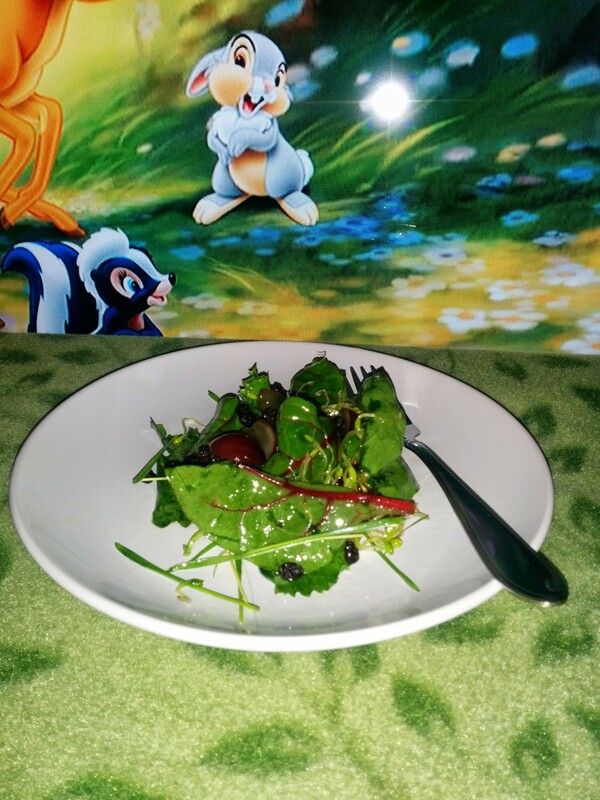 So without further ado, here is Thumper Salad. Mix kale, spinach, chard, sprouts, and grass. 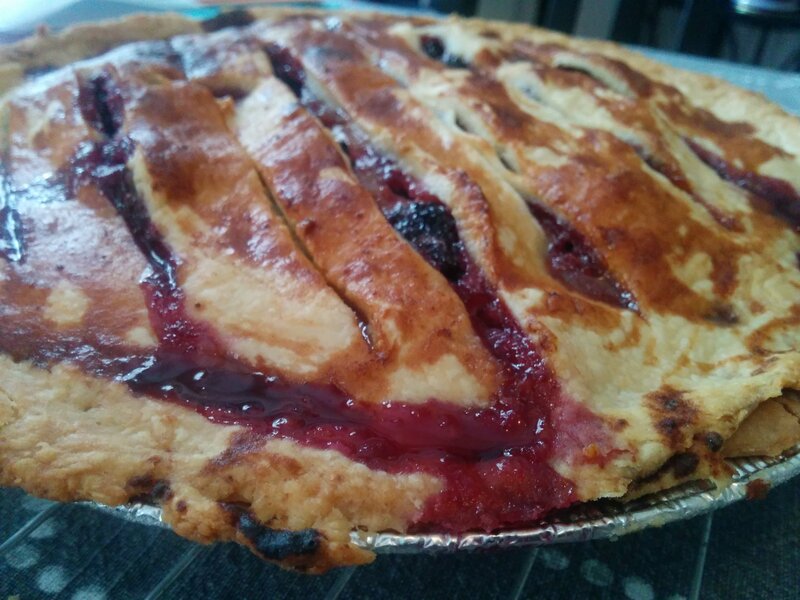 Throw with grapes, currants, and acorns. Sprinkle fried bark on top to taste. 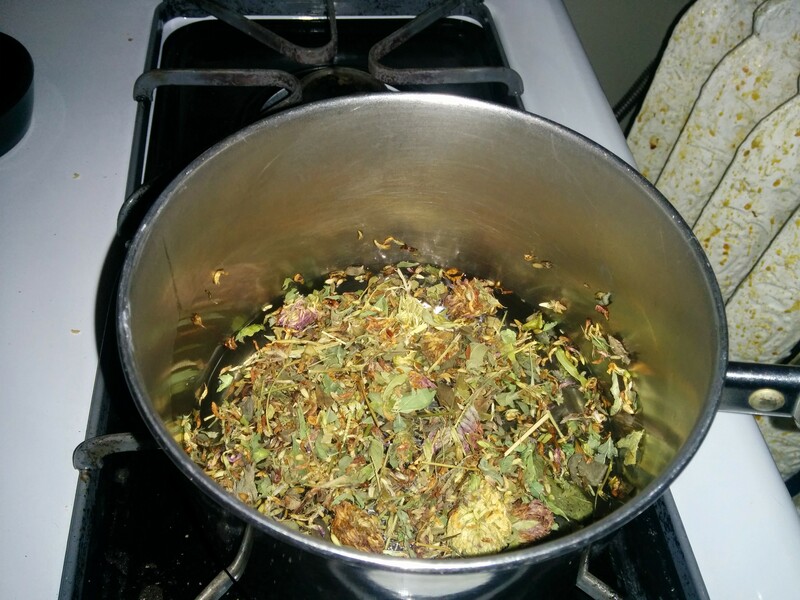 Boil water and red clover blossoms together for 7-10 minutes. Strain out and discard blossoms. Add the rest of the ingredients to the water, mix well. Will it save your mother from Man in the forest? 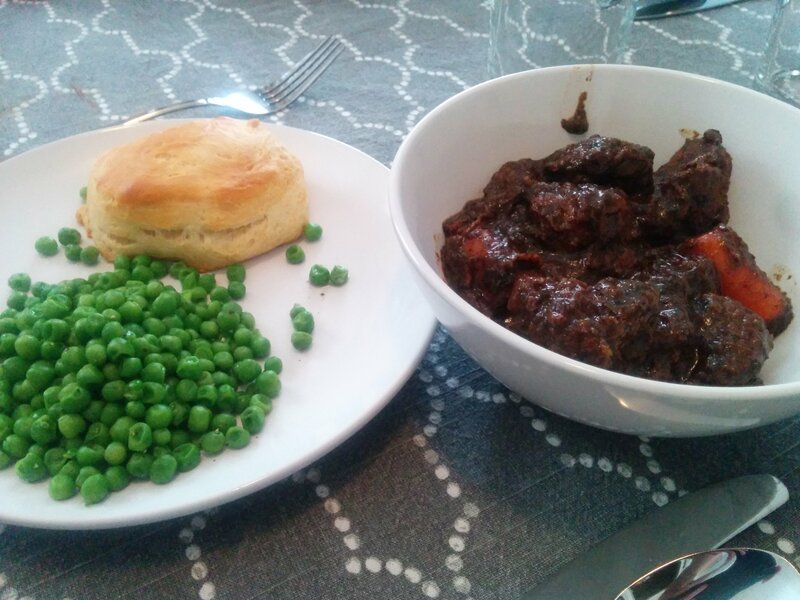 Well, like I said earlier, none of the food was really super tasty…but it wasn’t supposed to be. You could learn to live with it, if it were your only food source. The Red Currant was extremely tart, the grapes were good, the red clover made my stomach turn, the bark, and the grass tasted like grass. The salad was pretty good. It wasn’t anything special. I think I might have used too much Red Clover dressing.